Brad Burch with his Showtime FMX team mates following a performance in front of a capacity crowd. Photo by Shelby Garlick. In his eighth year at the Melbourne show as a stunt bike rider, Brad Burch has recovered from serious injury, writes Shelby Garlick. Some people work at their desks, wear suits, sit in meetings. Brad Burch rides dirt bikes for a living. 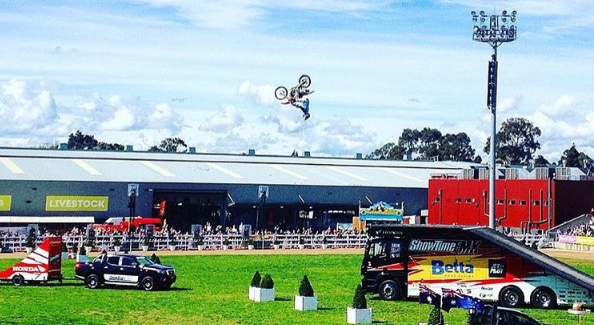 At 28, he’s in his eighth consecutive year as a stunt dirt bike rider with Showtime FMX at the Royal Melbourne Show. Riding dirt bikes hasn’t come without a few broken bones and scars. In a horrific accident in 2007, Brad broke both his legs at the same time during practice on the Gold Coast. At the time he was performing a move called a “holy grab” he had done over 100 times. While he has little recollection of what happened, his practice teammates have told him he became separated from his bike and landed awkwardly. Brad comes across as your average “Aussie bloke” who just can’t get enough of riding. While he seems timid and reserved, his passion for riding is evident whenever the topic arises. His blonde hair, blue eyes and clean look make him easy on the eyes and a perfect pin up for his sponsors. His lack of piercings and visible tattoos separate him from his FMX teammates. He could very easily be mistaken for a man who wears a suit to work – if you couldn’t smell the dirt kicked up onto his clothes. 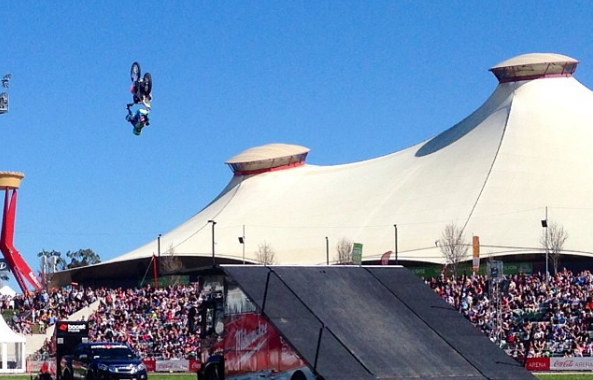 Now in its 15th year, the Showtime FMX show is one of the Melbourne Show’s popular events. The team of four professional stunt riders’ performance includes a race, complete with jumps, hay bale and barrel obstacles. Then comes a jaw-dropping stunt jumping performance, where the four get to show the awed crowd some death defying mid-air stunts. On fine days, the arena is full, many punters are made to stand and watch as the world class riders go about their business. “Tommy G”, who MCs and manages the Showtime FMX riders, says Melburnians are very lucky to have the opportunity to see world-class riders performers live. “There’s no doubt that Brad and the other guys are remarkably talented. I see them as world-class athletes. Both Brad and (teammate) Robbie Maddison have just returned from an overseas Nitro Circus tour, which is the pinnacle of freestyle riding in the world. The capacity crowd we see pretty much every day just goes to show they are a real attraction at the Melbourne Show.” Tommy describes their professionalism and athleticism that goes into the sport as “second to none”.